Growing up on the Gulf, billowing and bellowing beginnings of tropical storms vehemently interrupted many summer slumbers. No matter the time of night, staying under the covers whenever a storm was brewing right outside was not an option. I remember meandering downstairs and finding the largest window in our house to sit next to (which is NOT recommended during a storm!) I lugged a heavy, wooden chair next to one already perched at the window. I knew someone else was awake and being amused by the marvel of belly aching thunderclouds and blinding streaks of lightning. A small thud came from the kitchen and within moments, my dad sat next to me with a glass filled to the brim with milk, an entire package of Oreos and handed me a cookie. We sat in silence for what seemed like hours, observing cracks of lightning illuminating the sky and thunder so booming the windows shuddered from its mighty force. Gusts of wind blew over the landscape, toppling over our poor ferns that hung in between the towering white columns of our plantation-style home. In the morning, Mom went on about the massacre of ferns on her front porch destroyed by the storm and the mystery of an opened package of Oreos left on the counter. I shot a glance at Dad, and we both just smirked at each other over our toast and chocolate milk. Neither one of us was willing to confess about our clandestine weather related midnight meetings and countless cookie consumption. 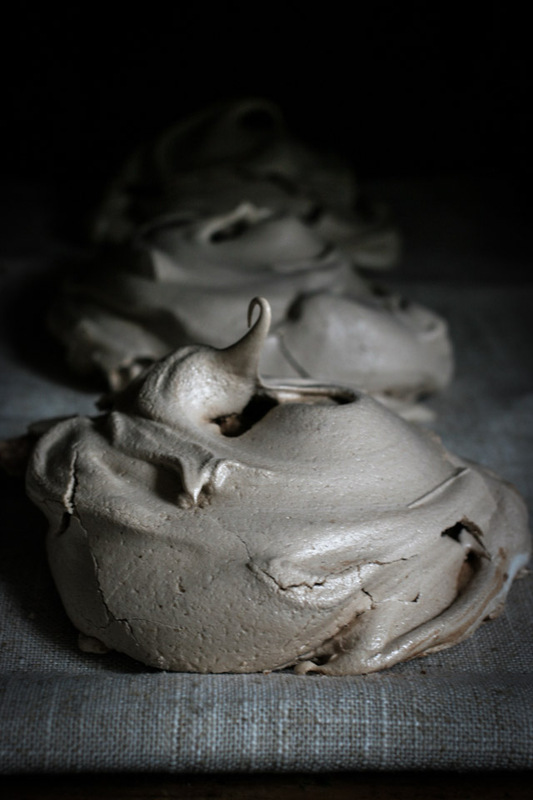 Note: These murky meringues remind me of heavy-bottomed rainclouds and the countless chocolate cookies I consumed during thunderstorms, and please do not fret if there are cracks in the meringues after they are baked and set aside to cool. The cracks remind me of cracks of lightning and I consider these imperfections beautiful! In the bowl of a stand mixer, whisk the egg whites, sugar and salt just until combined. Place the bowl over a pot of simmering water and stir with a rubber spatula until the sugar has completely dissolved. This can take a few minutes. Feel the egg mixture between your fingers to check for graininess. Once the mixture feels completely smooth, put it back on the stand mixer and beat with whisk attachment on medium-high speed until the mixture is light, fluffy and glossy. Carefully fold in cocoa powder. Using a tablespoon, create mounds of meringue on the prepared baking sheets. With a teaspoon, create the “swirl” pattern by circling around the base and working your way up the meringue. Bake for 1 ½ hours in a 200 degree oven, then shut off the oven for 30 minutes. Take the meringues out of the oven and let cool. Using a spatula, gently remove the meringues off of the baking sheets and store in an airtight container if not consuming immediately. So sweet! Thank you so much! I adore sharing my memories and recipes on otherwise dreaded Monday mornings for most! Thank you for the words of encouragement! I love watching storms with dad too! Those are some of my favorite memories! Love this story..Such a great memory to share. This meringue recipe sounds incredible. Thank you so much, Erika! I’m so happy you enjoyed the post! What a wonderful memory to share with your father. Some of the best moments are the “don’t tell your mom” secrets, huh? Beautiful light in this image … so moody and ominous, just like a raincloud. Thanks, Trisha! It is a special memory I keep in my pocket. Also, I love the way the photography and the meringues went with the story as well. Thank you so much for the compliment!